ABSTRACT: Several foraminiferal species of Cenomanian-Turonian age have been recorded from the Umm Khayshar section in Southern Galala Plateau, Eastern Desert, Egypt. The most abundant species are: Thomasinella fragmentaria Omara, T. punica Schlumberger, Biconcava bentori Hamaoui, Daxia cenomana Cuvillier and Szakal, Flabellammina aegyptiaca Said and Barakat, F. alexanderi Cushman, Nezzazata gyra conica (Smout), N. simplex Omara, Dicyclina sampoi Cherchi and Schroeder and Nakkadyia awadi (a new genus and a new species). 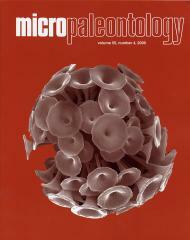 The occurrence of Whiteinella archaeocretacea (Pessagno) delineates the latestCenomanian-Early Turonian interval through theMaghra ElHadida Formation. The identified fauna provide an interpretation of the environmental conditions that prevailed during the Cenomanian-Turonian age. The Cenomanian transgression occupied most lowlands marked by shallowmarine facies. At the end of the Cenomanian, sea-level rise deposited mixed clastic – carbonate rocks with a considerable faunal content. At the start of the Turonian, awidemarine transgression took place as reflected from the planktonic/ammonite-bearing rocks.